﻿ How to Convert FLV to MP4 on Mac OS X (Mountain Lion included) or PC? Home » video » How to Convert FLV to MP4 on Mac OS X Mountain Lion or Windows 8? 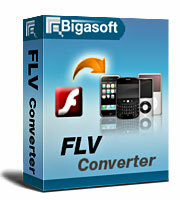 How to Convert FLV to MP4 on Windows 8 or Mac OS X Mountain Lion? Have you downloaded some interesting videos from YouTube? And have you been bored that could not play them on your iPad, iPhone, iPod touch, iPod nano, Archos AV500, Archos AV700, Archos Gmini402, iRiver PMP-100, Creative Zen, Vision, Zune, and so on? Of course, portable MP4 player won't play FLV format. Then we need to convert FLV to MP4 for more widely accepted. Bigasoft FLV Converter (for Mac), the professional FLV to MP4 converter for Window or Mac, can easily convert FLV to MP4 on Windows (including Windows 8) or Mac (including OS X Mountain Lion) without losing any quality. And you can also have a free try at first. The following is a step-by-step guide on how to convert FLV to MP4 (MPEG-4) with the powerful FLV to MP4 converter for Mac OS X Mountain Lion or Windows 8. 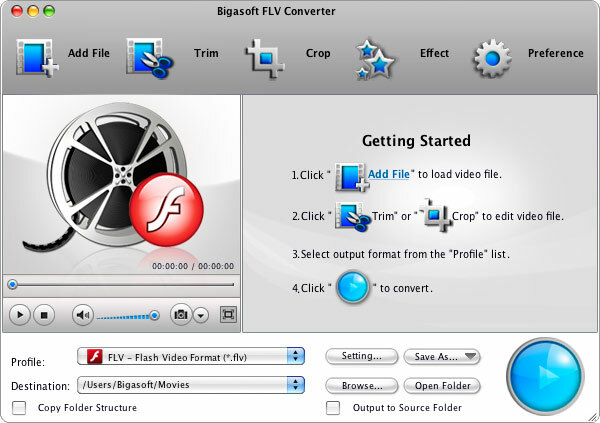 Free download, install and run Bigasoft FLV Converter (Windows Version, Mac Version), the following interface will turn up. Click "Add File" button to import FLV files, and then click "Open". Tips: You can also import FLV files by dragging FLV files directly into the main interface. Select suitable MP4 format from the "Profile" drop-down list. Click "Browse..." button to specify a location for the converted files. If you want to open the output folder, you can just click "Open Folder" button. Click "Start" button to begin converting FLV to MP4. It will be finished with high output quality and converting speed. "Trim" function helps you convert only your wanted clips by setting the start time and the end time. "Crop" function is for you to cut off the black edges of the original movie video. Effect function is for you to customize video like adding watermark, subtitle, audio track, artistic effects. "Preference" function is for you to set output effects, image type, CPU usage and action after conversion done, etc. "Settings" function is for you to set parameters of your output files such as frame rate, resolution, channels, sample rate, video/audio codec, video/audio bitrates, etc. Just free download Bigasoft FLV Converter (for Mac) to enjoy your favorite YouTube videos on your iPod, iPhone, Zune or other portable players.